BAGHDAD - An Iraqi official and a Sunni tribal leader say Islamic State of Iraq and Syria militants have shot dead 36 Sunni tribesmen, women and children, pushing the total number of people killed by the group's apparent drive to punish the tribe in recent days to more than 200. Sheik Naim al-Gaoud, a senior figure in the Al Bu Nimr tribe, says the militant group on Monday killed 29 men, four women and three children, lining them up in in the village of Ras al-Maa, north of Ramadi. He says they publicly shot each of them dead one by one. He says that 120 families are still trapped there. 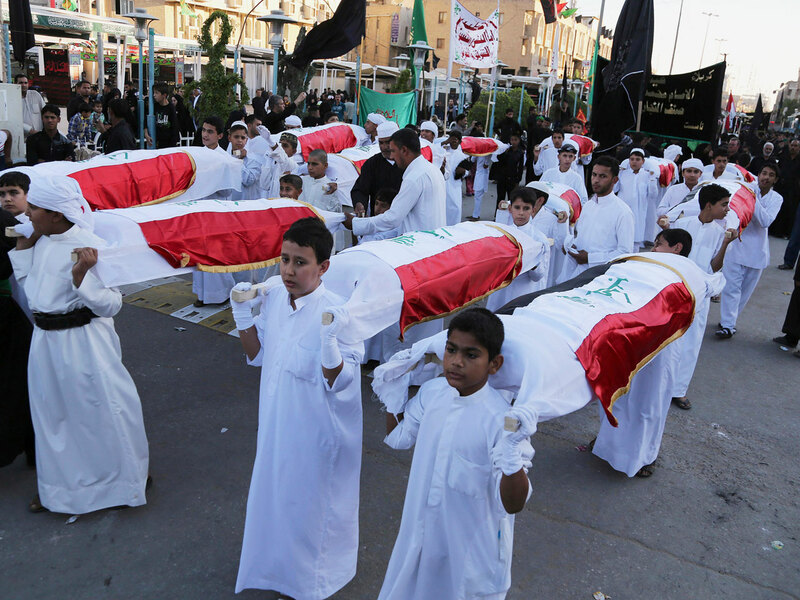 An official with the Anbar governor's office corroborated the account of Monday's killings. He spoke on condition of anonymity as he was not authorized to brief journalists. Analysts believe ISIS may be trying to take revenge for the tribe siding with the American forces in the past, as well as Iraqi security forces. The killings also likely will terrify other Sunni tribes that would think of resisting the militants. Earlier this week, Human Rights Watch reported that ISIS executed 600 Iraqi prison inmates when they seized the country's second-largest city of Mosul in June. On Friday, the Security Council issued a statement expressing "deep outrage" at the ISIS killings, kidnapping, rapes and torture in Iraq, saying the group's actions "may constitute war crimes and crimes against humanity." ISIS militants have overrun a large part of Anbar province in a push to expand their territory across Iraq and Syria. Officials with the Iraqi government, as well as officials with the U.S.-led coalition targeting the extremists, repeatedly have said that Iraqi tribes are key elements in the fight against ISIS since they are able to penetrate areas inaccessible to airstrikes and ground forces. Some Sunnis in Anbar supported the militants when they seized Fallujah and parts of Ramadi in December. That came after widespread Sunnis protests against the Shiite-led government in Baghdad for what they described as second-class treatment. Since ISIS' major offensive in Iraq, a number of Iraq's Sunni tribes have been fundamental in stalling its advance, taking up arms and fighting alongside Iraqi security forces. Ramadi has yet to fall in part because of key Sunni tribes in the city. The Jughaifi and al-Bunimer tribes have helped Iraqi special forces protect the Haditha Dam in Anbar. In the battleground town of Dhuluiyah, the al-Jabbouri tribe has been the sole resistance to an ISIS militant takeover. In the vast province of Anbar, some 5,000 tribesmen are backing government efforts to take part in the fight and receive arms and financial compensation. With tribes often numbering 30,000 to 40,000 people, the effort still has a long way to go, however. Meanwhile Monday, ISIS claimed responsibility for two bombings on Shiite pilgrims that left 23 people dead in Baghdad a day earlier. In a statement posted online late Sunday, the group said the car bomb attacks happened despite the tight security measures amid the Shiites' "biggest infidel event." The two attacks, on Sunday, targeted Shiite pilgrims and the roadside tents serving them on their way to the holy city of Karbala to mark the Ashoura religious holiday. Ashoura commemorates the seventh-century death of Imam Hussein, a grandson of Prophet Muhammad, and an iconic martyr among Shiite Muslims. Sunni insurgents frequently target Shiites, who they consider heretics. Also Monday, police said a bomb struck a group of Shiite pilgrims, killing five people and wounding 11 in Baghdad's southwestern suburb of Nahrawan. Another a bomb blast on a commercial street killed three people and wounded 11 others in Baghdad's western district of Amil, police said. In the western suburbs of Baghdad, a roadside bomb blast struck an army patrol, killing two soldiers. Hospital officials confirmed the casualty figures from the attacks. All officials spoke on condition of anonymity because they were not authorized to talk to journalists.